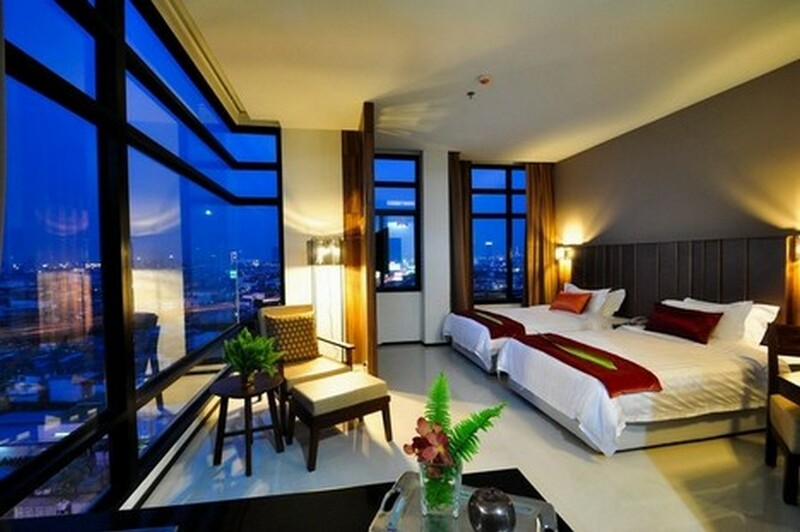 The Bangkok Chatrium Residence equates luxurious comfort. 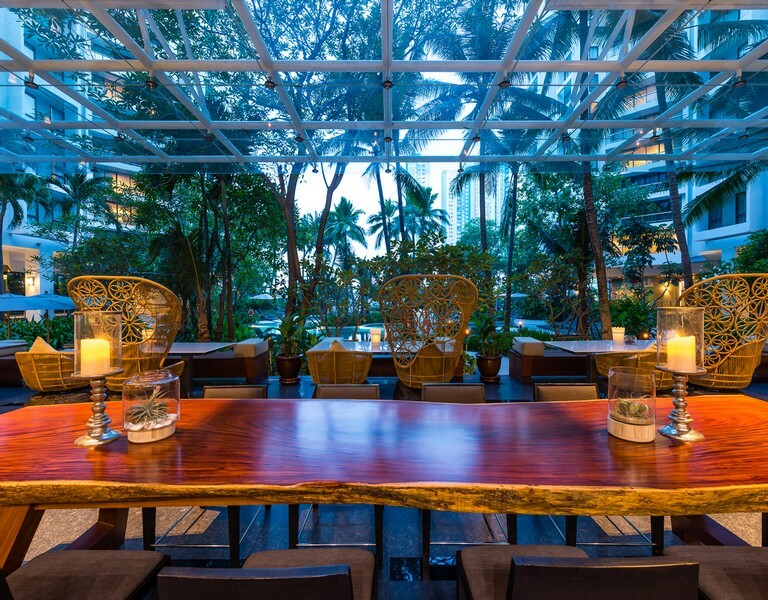 This splendid hotel is located in Sathon, alongside many other trendy hotels and shops, in one of the main business districts of Bangkok. 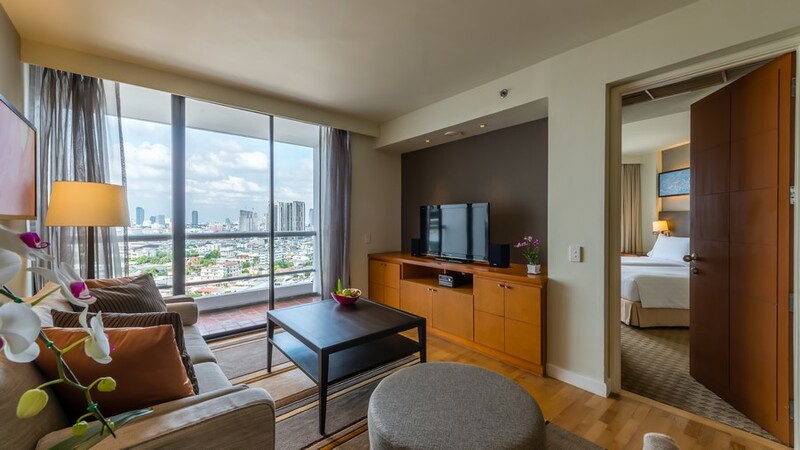 The Chatrium Residence is a serviced apartment hotel that gives its customers the unique and vibrant experience of an attainable contemporary city oasis, through the creation of a secluded paradise in the bustling city that is Bangkok. 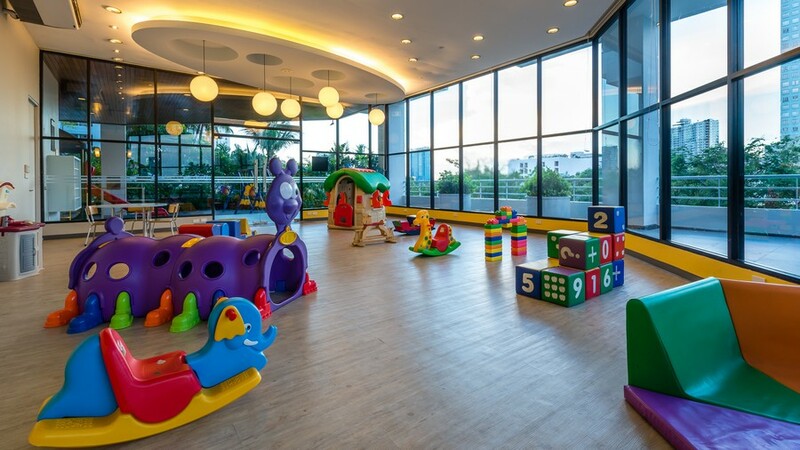 For short or long stays, their comfort crafted studios and suites provide all the amenities that would rival any of the 4 star hotels in Bangkok. 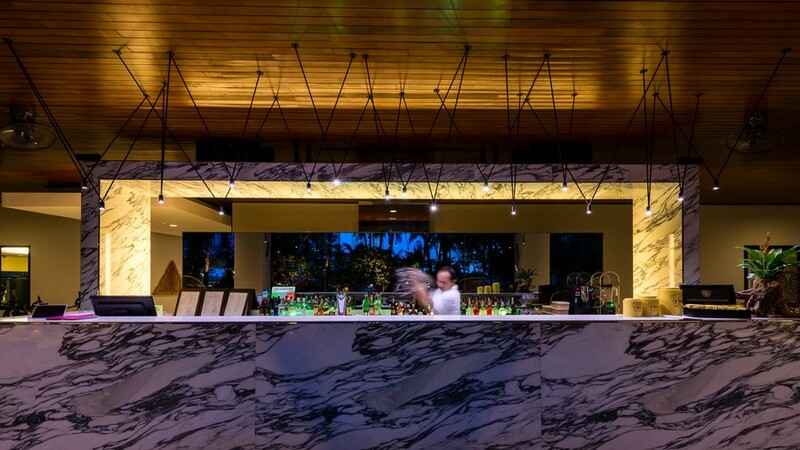 You’ll find everything you need from three restaurants and bars, a minimart, self-serve launderette, kids play area and a resort-style lagoon swimming pool. Green Leaf Spa offers sensorial escapes, whilst a driving range and snooker table provide relaxing recreation. Hold private meetings in their 243 person capacity Meetings & Events space, or they can organise an event by the pool with exciting entertainment for you! The Chatrium caters to each of the five senses of its exquisite and sybarite customer base. The aromas in every part of the hotel differ, from violets, to vanilla and roses to cinnamon, the aesthetics in every room, lounge, and facility take into account space, color and shape to create unrepeatable ambiances, the textures take over achieving comfort rarely found in the vastness of a hotel of such calibre, and finally taste; with its three distinct dining venues, Albricias, Flow Oasis Pool Lounge and the Lobby Lounge, The Chatrium Residence satisfies all five human senses..
As you enter the Chatrium Residence you are welcomed by the front desk staff with their warm traditional Thai attention and the accuracy and efficiency of a Swiss clock. Towards the left of the reception area is found the Lobby lounge, accommodated with majestic yet incredibly comfortable sofas in which an array of teas and other beverages can be enjoyed while waiting to be picked up to explore the city or simply reading a book with the exhilarating natural sunlight entering through the large glass panes. On the fourth floor is found the symbol of the city oasis, a large undulated swimming pool with both distinct shallow and deep areas joined by a bridge. 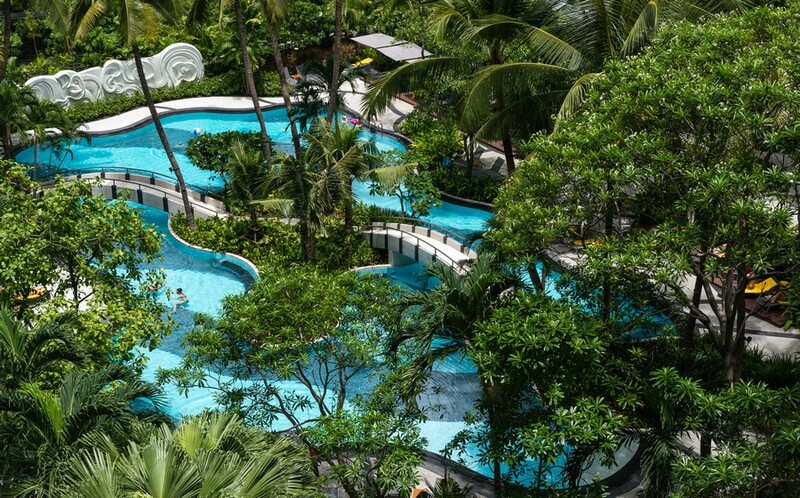 The swimming pool is surrounded by large leafy greenery which takes you deep within a rainforest, a tropical paradise surrounded by skyscrapers. Swimming at the Chatrium is an experience that makes you come in touch with all the nature Bangkok city seems to lack. Beside the pool, is the Flow Oasis Pool Lounge, decorated with seats that look like bird nests, from which one can enjoy lunch by the pool, a snack while checking up on the kids, or creative cocktails in the refreshing evening breeze of Bangkok. On the same floor as the tropical paradise is the majestic Albricias restaurant. Worlds apart from the rainforest, it takes its customers deep into a modern Japanese hall, with its simplistic murals and the usage of cool colors such as blue, white, violet and beige to paint autumn and winter trees being blown in the wind. It is then wonderfully unexpected and a shake to the senses, that the decor does not dictate the cuisine. Japanese dishes are served once a week, however, Albricias is inspired by Mediterranean flavours. French, Spanish, Italian and Greek cuisine take over the restaurant and it does so with the best imported foods for the palate; French cheese, Spanish ham, sweet and dry wine and most essentially quality olive oil. Albricias offers such exquisite food, that it often attracts customers outside of hotel residents. Room types include the 45 square meter Deluxe Studio Suite which is ideal for those staying alone or as a couple. Within the room you’ll find complete convenience with a luxurious bathroom, kitchenette with microwave oven and refrigerator, and a separate dining area. When we had the pleasure of staying at Chatrium Residence we opted for their 70 sqm Deluxe One-Bedroom Suite. The suite offered everything we needed for a truly enjoyable stay. We didn’t, but you can prepare your own meals in the kitchenette and the 70 square meters gives you plenty of space to relax in the dining and living area. The inviting bedroom provides peace and relaxation for a dreamy night’s sleep and having the separate bedroom from the living area is great if one person gets up before the other. If you’re traveling with family or even a group of friends, their 140 sqm Grand Deluxe Two-Bedroom Suite provides ample space for rest, relaxation and the best of times shared together. Each bedroom is luxuriously appointed with LCD TVs and comfort calling beds. The Master Bedroom features an indulgent en-suite bathroom as well as a shared bathroom attached to the separate and spacious living area. A convenient kitchen is fitted with an oven, microwave and refrigerator, perfect for preparing a delicious dinner or party bites. Finally, the Chatrium’ s Grand Deluxe Three Bedroom Suite at 140 sqm, offers relaxation, privacy and all-round comfort for families and groups of friends. You’ll find space for everyone in three separate bedrooms, two bathrooms, living room, separate dining area with large dining table, a fully equipped kitchen and your very own private balcony. It’s the ideal home from home and a true sanctuary away from the bustle of Bangkok. If you are a fitness junky or just don’t want to end up “morbidly obese” the Chatrium’ s Fitness Center is fully equipped and has everything from cardio exercise machines to free-weights. If you need some inspiration or tips on how to get the most out of your workout, their experienced fitness instructors are always on hand to help out. Take part in aerobics, yoga, Muay Thai and many more fitness classes, before melting your aches and pains away in the steam room, sauna or Jacuzzi. After a long day of meetings or a rough day of hitting the plentiful shopping malls, the T-Zone recreation area is there to help you relax. Here you can fine-tune your golf swing, your putting precision and your snooker shots. With a driving range, putting green and full-sized snooker table, you can keep on top of your sporting hobbies and enjoy doing so. If recreation isn’t enough to get your body to relax after a punishing day then there is always the Chatrium’ s Green Leaf Spa. Here you can Heal the mind, body and soul in their earthly surroundings. Fall into a blissful trance with pampering treatments that will erase every stress and worry from your body. It’s the perfect place for some well-deserved indulgence after a long day. Whether you are staying overnight or over a month, the Chatrium Residence was designed to accommodate you in comfort and style at a reasonable price.